The common housefly is a carrier of many diseases; it is also an annoying critter which sneaks up on us at the beach or during camping. 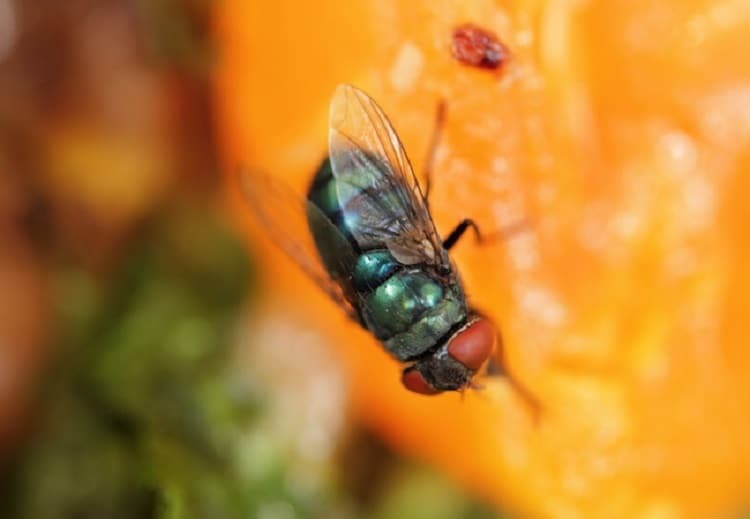 Typically, flies enter our homes in summers but if you have houseplants or happen to keep food lying around, then flies may become an all-year-round problem. Here are 12 easy ways to keep flies away. This is certainly the easiest way to shoo flies away but it may not be the most effective technique. Flies are expert fliers and getting one may not be as easy as you might think. You can certainly use a fly swatter to keep the air circulating around you. A fan will keep the air circulating to shoo the flies away. This is the best way to keep flies away indoors. However, if flies happen to trouble you at a beach or a campsite, then you might need a portable fan for the job. Do not spray near kids or pets. Keep all chemicals away and out of reach of children. Keep the fish aquarium covered when spraying. Cover all food before spraying. Wash kitchen countertops and dining areas after spraying. Also wash your hands immediately after using the product. If flies are getting attracted to your kitchen garden you could plant certain aromatic herbs to repel them. These include basil, lavender, eucalyptus, lemon balm and thyme. You could even crush a few of these herbs to release their strong aroma in the environment which will repel all kinds of bugs naturally. This is a wonderful way of repelling flies from your kitchen; it also works on chiggers, mosquitoes and fruit flies or gnats. Hang a fresh bunch of basil in the kitchen; also bruise a few of its leaves to release the aroma. This will repel all kinds of insects. Make sure you replace the bunch every day with a fresh one. This is the most important method of preventing flies inside the home. Cover all food stuff and store leftovers in sealed containers. Also cover trash cans. Wipe away table tops and dining areas immediately after cooking/eating. Keep dirty plates inside the dishwasher until you are ready to wash them (or wash, rinse and store them inside cabinets immediately after use). Wipe floors and tabletops in case of spillage as soon as it occurs. Flies are attracted to food as well as moist places. As far as possible, keep your kitchen and bathroom drains clean. You can use a mixture of vinegar and baking soda to wipe down sinks. Also, pouring hot boiling water and baking soda down greasy drains every once in a while will help you cut the grease that attracts these insects. You can also pour bleach regularly in the drains to keep them clean. Do not allow produce to rot outside; consume it immediately. If fruits and veggies happen to get over ripe, use them in recipes, store them in the refrigerator/freezer or trash them outside in covered bins. In case of high fly populations, you need to invest in fly traps. A simple fly trap consists of two main parts: a container having the fly bait and its cover with an opening. The bait ideally consists of food that attracts the flies into the trap. You can make an effective fly trap easily using an old plastic container. Add some ripe, mashed bananas, wine and apple cider vinegar in the container. Cover the container with a plastic film. Using a sharp object, make a few holes in the plastic film. The flies are attracted to the sweet smell of the wine and fruit and fall into the trap but are unable to fly back out. They eventually drown in the sweet mixture. This is another easy way to keep flies away especially from your kitchen garden. Commercially available fly traps with sugary, sticky substance lure the insects onto them. Suspend the sticky tapes from the ceiling near your kitchen garden to reduce fly populations. You will need to invest in a fly electrocuting grid. Flies come in contact with the grid as they are attracted to its light and die upon contact. Make sure you clear away pet feces and litter boxes since flies love these things. Keep pet food covered always. Discard leftover food immediately. Wash the pet’s food bowl regularly and also clean its water bowl from time to time. These 12 easy ways to keep flies away will definitely do the trick. However, it is also very important to identify their food source and clear that up first-to get rid of the problem permanently. If not, you might want to call up a Pest Control Company and use stronger chemicals to get rid of flies once and for all.